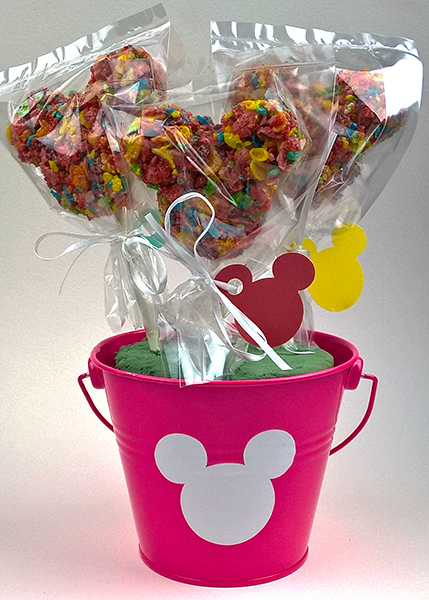 For our #DisneyKids Preschool Playdate I made these awesome Mickey treat party favor centerpieces! They really were not hard at all, and can be made ahead of time. 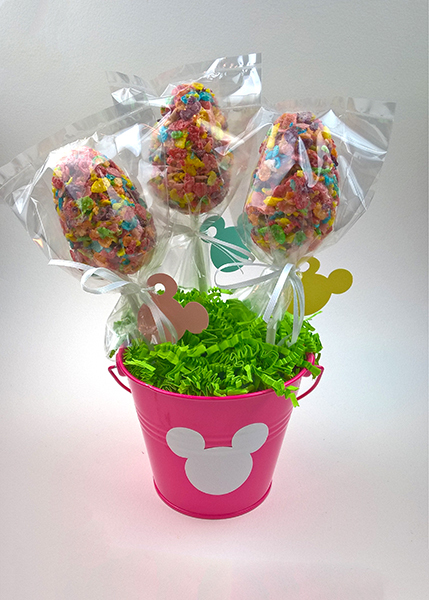 Perfect for a Mickey Mouse Clubhouse birthday party! 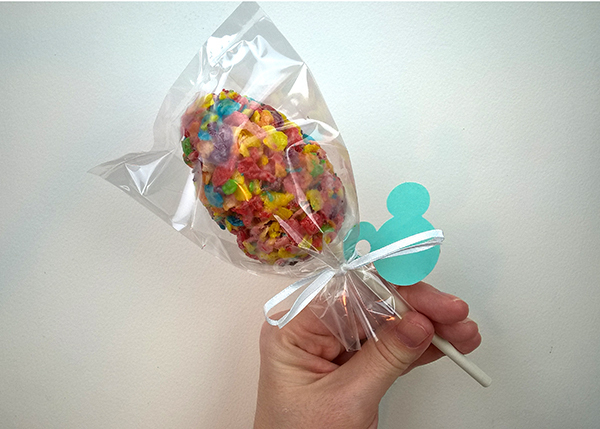 I made two variations; a Mickey head treat and an Easter egg treat as our #DisneyKids Preschool Playdate was held on Easter Sunday. I’ve included both variations here. 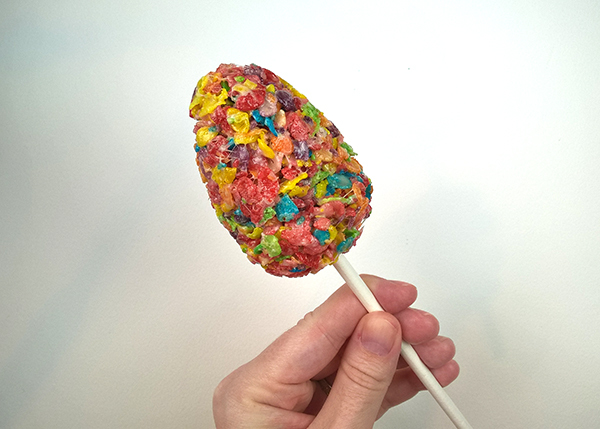 Start by prepping a basic Rice Krispie treat recipe, only switch out the Rice Krispies for Fruity Pebbles. 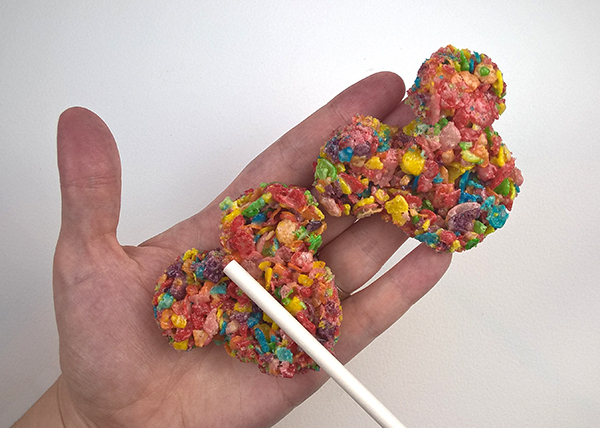 Fruity Pebbles just look like more fun! I used this recipe found on Kelloggs.com. 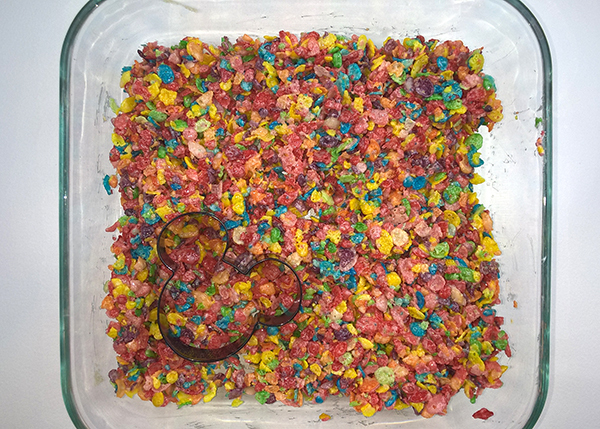 Now, I made one heck of a mistake, I didn’t grease my dish before laying out the Fruity Pebble treats. It still worked, but it was just a bit harder. I’d also suggest greasing the cookie cutter as well. 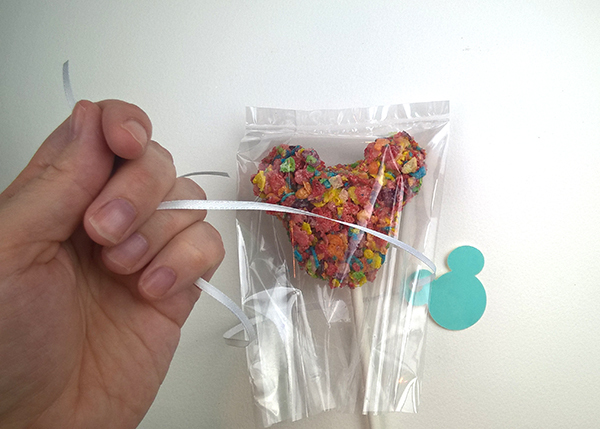 Use the cookie cutter to cut out as many Mickey Heads as possible. I found that it worked much better after the treats had cooled for a bit. 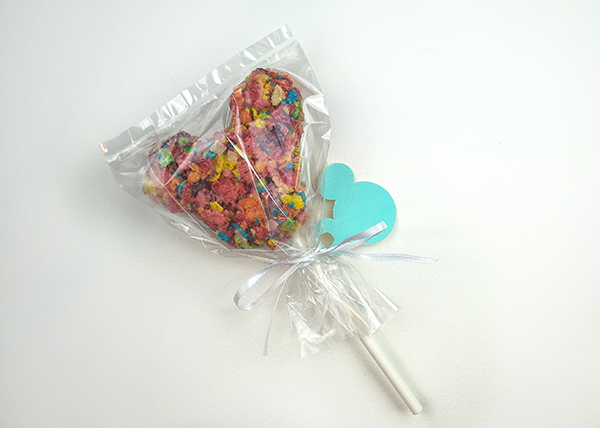 Take two Mickey heads and place a lollypop stick between the two of them, and squish together. You might have to mold the edges just a bit. I also placed the treats in the freezer for a minute to make sure they hardened together properly. Next, you’ll need your cardstock. We’re going to make a cute little tag. Of course you don’t need to make one, but it adds a bit of sass, and makes them look closer to store-bought. I used a large Mickey hole punch and a regular hole punch. Take your food-grade favor bag and trim it to the correct size. If you don’t have any favor bags, you could also try cutting the zipper off of a sandwich bag. Grab your ribbon. I’m using a $.50 spool of white ribbon from Michaels. Super cute, right? This would be an awesome favor on its own. But, we’re going to keep going and create a centerpiece. 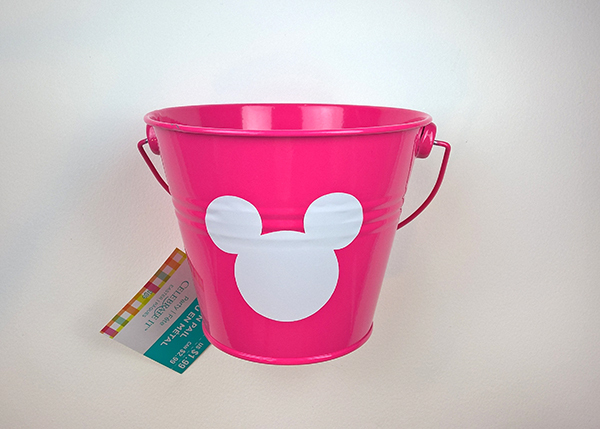 I took a $1.99 metal pail bucket and added a Mickey head from white vinyl. I used my Brother Scan N Cut to cut it out, but this isn’t necessary. Take the Mickey head template from DisneyFamily.com and select the size you need. Cut out the template, and then tape it to vinyl, contact paper or even white label paper, and carefully cut it out. 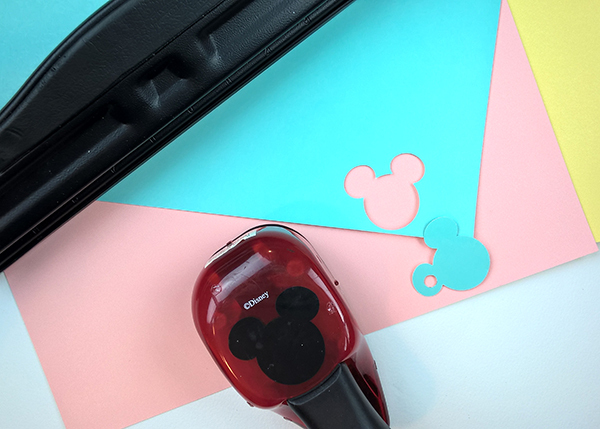 If you have a Mickey hole punch, this could work well, too. 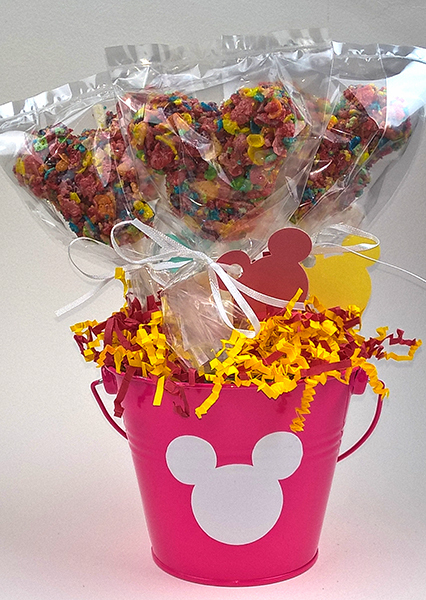 However, the Mickey head I used is much bigger than my large Mickey punch. 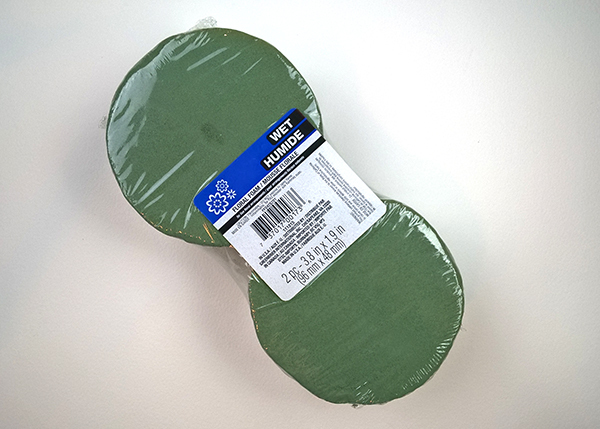 I purchased floral foam from my local dollar store. I grabbed the “wet” foam, but really the silk flower foam would have worked much better. 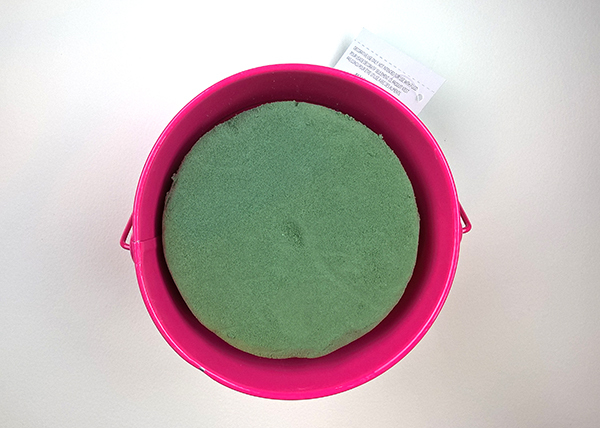 This size fit nicely into my pail bucket. Add some paper shred, and viola you have an awesome centerpiece! Our #DisneyKids Preschool Playdate was on Easter Sunday, so I had to throw in a bit of Easter cuteness! I made a second version of this centerpiece molded from plastic eggs. 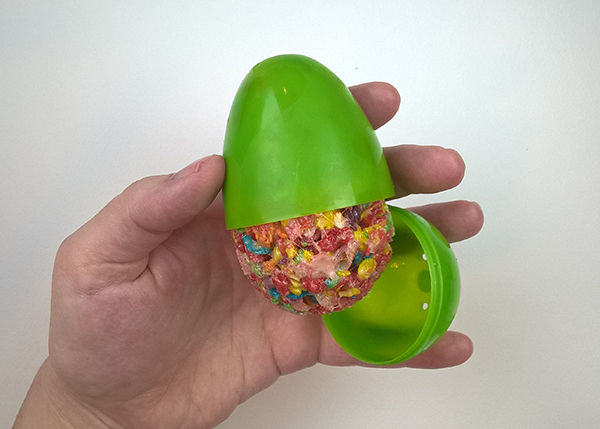 I started off with the same Rice Krispie Treat recipe from Kelloggs.com, but instead of letting the treats cool, I quickly placed the treats into a greased plastic egg, and then threw them in the freezer to harden. 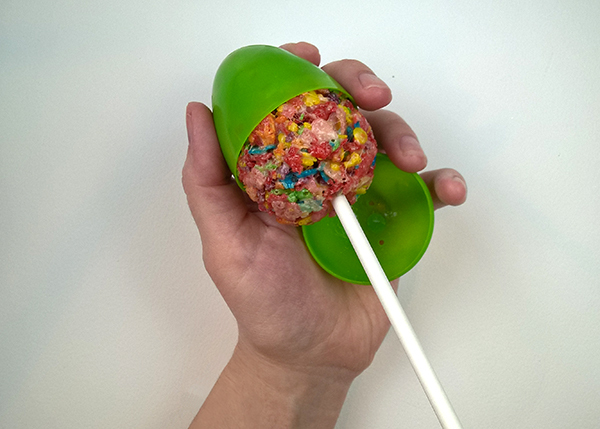 While the treat was still in the egg I punched through the bottom with a lollypop stick. I found it better to do this than if I took the treat out completely. The ones I had taken out looked a bit more misshapen. I really thought these came out well. I hope that you’ll enjoy them as much as I did!